GenieFunGames - GFG Genie 5 Door Escape another point and click escape game developed by Genie Fun Games. 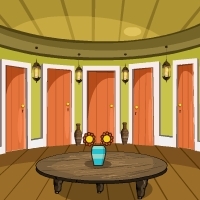 The story of the game is to open the 5 doors and escape from the house. Use and interact with object's, puzzle's, symbol's, clue's solve everything and finally escape from the house. Good luck and have fun! LOL Omega Im missing clue.. prob obvious one..
Derr me use the damn lightbulbs..
Would be a great game if it let us use logic to solve the puzzles on our own instead of needing the clues to unlock areas. thanks Leroy and AO for your helpful hints! Signs of a bad game include: smashing, cutting, and more than one colour clue to solve. This features the lot. Am I the only one that can't get help from this website? Pretty generic find clue and enter it as written game, with the exception of the crowbar being a key... Huh? 2 stars.